Puppy Mills…Not a place where dogs run free. This month a fabulous group, you might have heard of them “Concerned Bloggers” is again giving you some valuable information regarding mans best friend. This month topic is Puppy Mills and for those who don’t know, puppy mills is a commercial dog breeding facility that is operated with an emphasis upon profits above animal welfare and is often in substandard conditions regarding the well-being of dogs in their care. Similar types of operations exist for other animals most commonly kept as pets or used as feed for other animals. The term can be applied to operations involving other animals commercially bred for profit, e.g. “kitty mills. There are an estimated 4,000 puppy mills in the U.S. that produce more than half a million puppies a year Commercial kennels may be licensed by the United States Department of Agriculture which may inspect the kennels routinely. If you are a dog owner or a pet owner in general, I know hearing that dogs and even cats are subject to such cruelty as being kept in wire cages, no human companionship, no comfort is heart breaking. How would you feel if you was stuck in your room all day with no contact with anyone, no hugs, no sunlight, a breath of fresh air. That’s pretty much what life is like for animals who end up in these mills or farms where there care is disregarded for the sake of the ol might dollar. Puppy mills have been around for decades and actually surfaced after WWII in response to the widespread crop failure. USDA (United States Department of Agriculture) began promoting purebred puppies as a fool proof cash-crop. Dogs that are raised in puppy mills have increased chances of health and behavior problems due to the severe lack of care and living conditions. It’s an estimated 2,000-3,000 puppy mills (farms) in the Unite States with Missouri being the leading puppy mill state in the country. The most shocking thing is the standards that breeders are required to meet by law are extremely minimal. Which explains how puppy mills are able to get away with some of what we consider cruel and inhumane actions. Although puppy mills existence will not stop over night, but by supporting organizations who are against puppy mills and any other mills that harvest animals we all can make a difference. One significant way is to adopt animals in need instead of buying from pet stores who sell animals. Just because its a reputable pet store doesn’t mean there animals aren’t coming from puppy mills. Again requirements for breeders are substantial minimal. But to help get you started on being proactive against puppy mills and animal cruelty in general below are sites that I found with some valuable information on puppy mills and what we can do to help stop them. Also take the pledge!!! Pledge that you’ll never shop in a store that sells puppies—even if you’re just buying food or toys. Last but not least here’s my little guy who I love to pieces and adopted a few months ago. His name is Momo, loves to run around, chew on my shoes and his favorite snack is apples and peanut butter. My crumb snatcher! 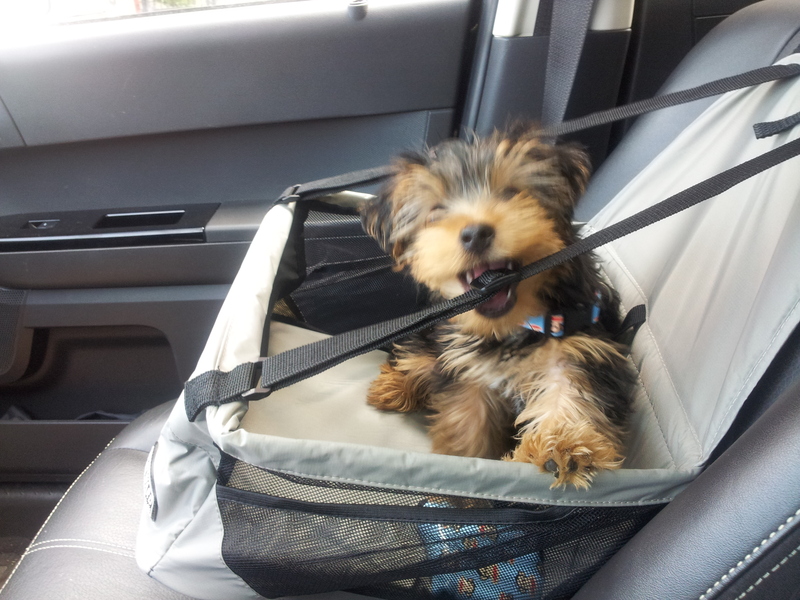 As you can see he doesn’t like his car seat but he has to be safe. /me steals that puppy and runs far away. OMG. MOMO is so effin’ CUTE!!!!!!! !